This month AJ tried Stella & Chewy's Beef Heart Freeze-Dried Raw Dog Treats. Even though the treats left my hands with a slimy texture, AJ approved and didn't seem to mind. He sat like a human just to get a bite! I don't recommend the treats for training sessions as they are hard to break. However, they are great for sharing at the park as the ingredients are very simple (less risk of a dog being allergic) and I would be shocked if I met a dog that did not enjoy these treats! This month AJ tried Stella & Chewy's Red Meat Wild Weenies Freeze-Dried Raw Dog Treats. I love giving AJ Stella & Chewy’s because I know I can always trust their ingredients. AJ loved the Wild Weenies and couldn’t get enough. They reminded me of cheese puffs and when he munches on them it is the cutest thing! Unfortunately, they do leave his breathe smelling worse than usual… But he does love them, so I will put up with the smelly breathe! Lay the cover on the seat and over your floors. Loop the straps around all four headrests and adjust for a snug fit. Push the anchors through the seat gaps and you’re all set! The cover also has handy storage pockets, closeable slits for easy seat belt access, and “seatbelt keepers” to hold the seat belt out of the way. It’s also machine washable for hassle-free cleanup. AJ loves this product, and so do I! Nocci and AJ have been doing great ever since we switched their kibble to Taste of the Wild PREY. A healthy pup means a happy pup! PREY can help determine or avoid the cause of a food allergy or intolerance. Food allergies account for approximately 10-20 percent of allergies affecting dogs. Most allergies are caused by one or more of the protein sources in the food. Additionally, fewer ingredients could be beneficial to dogs or cats who have known intolerances to one or more ingredients, such as eggs, grains or a particular protein source. As our dogs get older we realize how fast time flies by. We do not want to give our dogs food that isn't good for them for another day. Today is the day to switch your dog's kibble! Brushing your pup's teeth is as important as brushing your own teeth. But, let's face it...it's difficult to remember to brush your dog's teeth. Our vet recommends that we brush our dog's teeth daily, since oral disease is the dog's number one medical problem and 80% of dogs show signs of periodontal disease by age 3. In fact, if oral disease is left untreated it can lead to a whole slew of diseases. The Bristly Brushing Stick is a dental brushing stick made out of natural rubber that enables your dog to brush his or her own teeth daily. As your pup bites down on the bristles of the brush, he or she removes plaque. Nocci and AJ love chewing on their brushing sticks. For them, its a fun toy and for us, it's the easiest way to keep our pups healthy. For an added kick, we add Vibrac C.E.T. Enzymatic Vanilla-Mint Toothpaste, which has an enzyme to break down plaque and fights bad breath. Click this link to purchase your own Bristly Brush! The Burt's Bees Waterless Shampoo is perfect to freshen your pup up after going to the park and for in between baths. The spray is made out of water, apple, honey, eucalyptus, and other natural ingredients. It is pH balanced to prevent drying out your dog's skin. The smell of the spray is very mild. Yark is a brand that embodies "function, style and exceptional quality." Yark's dichromatic leather collars are timeless and modern. Not only are the collars sturdy, but they are long lasting. 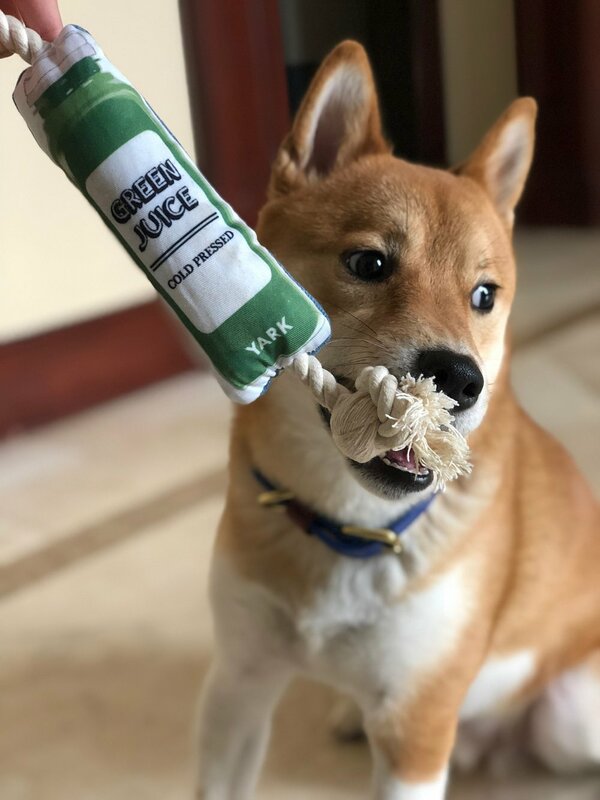 Yark has an Avocado Toast Toy, Green Juice Toy and Iced Coffee toy. We love their trendy look, but more importantly our pups love those squeaky-rope-toys. The Frisco Poop Bags are perfect for dog moms who walk their dogs in a fenced backyard. Instead of having to take out the entire roll when I go out to play with Nocci, I can pull one bag out of the box. Nocci has been eating Instinct Raw Boost Mixers since he was a puppy, and he loves them. He's been pretty picky with eating lately, so adding these on top of his food has definitely helped keep him on an eating schedule. This month, he tried the Beef and he liked them as much as the chicken. One of the key benefits of these treats is that the ingredients are grain-free, raw, and freeze dried, which locks in nutrients and flavor. The treats are all natural and minimally processed. In addition to the beef, the treats are packed filled with non-GMO fruits and vegetables. This month AJ tried Canidae Grain-Free PURE Bison & Pumpkin Chewy Dog Treats. The biscuits were a different texture than he is use to but he still enjoyed them. The soft baked treats have healthy ingredients (all you can actually understand), including peas, sweat potato, bison and more! Fortunately, there is no corn, what, soy or grain. I do not recommend giving to a puppy, as the Lifestage section says "Adult" under description on this website. This month AJ tried Nulo Freestyle Grain-Free Duck Recipe With Pears Freeze-Dried Raw Dog Food. The food can be served out of the bag or crumbled over their kibble. AJ loved the tasty bits, he even ate them as treats. Freeze-dried food is always a convenient and beneficial way of feeding your pup a balanced meal. "Potassium chloride is a mineral supplement used to treat or prevent low levels of potassium in the blood." "Zinc proteinate is the final product resulting from the chelation of zinc with amino acids and/or partially hydrolyzed proteins. It is used as a nutritional animal feed supplement formulated to prevent and/or correct zinc deficiency in animals." "Chelated copper (often listed as copper amino acid complex or copper proteinate) is widely regarded as the safest and most absorbable copper supplement." "Manganese Proteinate. See also: Manganese Sulfate. Two compounds which are used as a source of manganese. The manganese from manganese proteinate is a chelated source of manganese and is an antioxidant. It slows down the process of aging, activates many enzymes and helps utilize fatty acids." Nocci eats Ollie, a human grade dog food. But, as a snack or on the go, Nocci eats Health Extension Kibble. This month, Nocci tried the Health Extension Heart Shaped Treats and he couldn't get enough of them. The number one ingredient is free range chicken and they are made without artificial preservatives, flavors or fillers. Free Country is a brand committed to making the outdoors accessible to everyone, including the pups. The Down Jacket is the perfect transition jacket for the end of the winter cold and the Raincoat is great for all of the upcoming spring showers. The jackets are water-resistant and reflective. Not only are they easy to take on and off, there is also a hole for the harness and a pocket to hold treats, poop bags or even a ball. AJ can't get enough of his bone. He has spent hours of work on it, however after a few hours little pieces began to break off the bone. 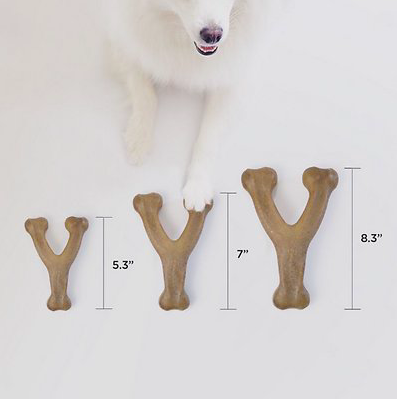 I did think the bone would have lasted longer, since we got the jumbo size. 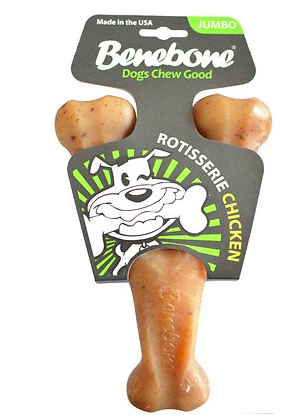 I think it's important to note the bone is not edible, as it could be confusing. Nocci loves his Benebones. He has the mini, regular and jumbo in chicken flavor. He prefers the mini and regular sizes (I think the jumbo is too big for him to hold). 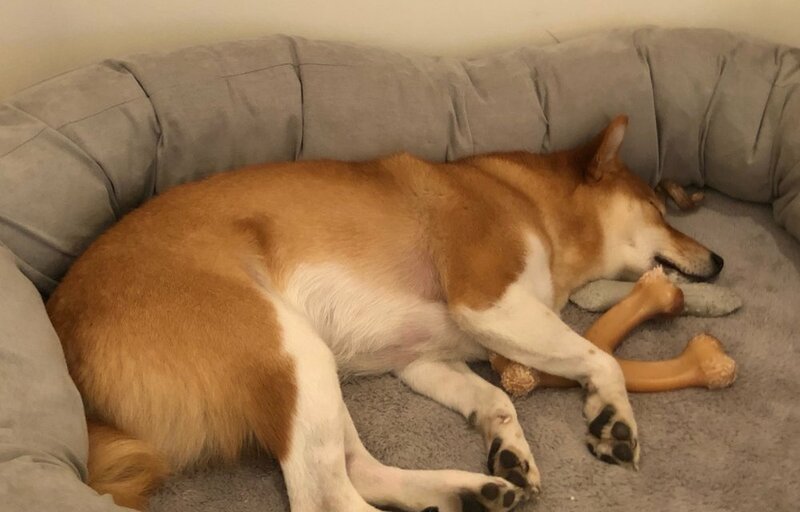 Although Nocci has never broken off a piece of his Benebone, it is important to supervise your dog whenever he or she is chewing on a bone. Instinct Oven-Baked Biscuits are one of Nocci's favorite treats. He has been crunching on them for over six months and they never disappoint. When Nocci accepts one of these biscuits, he runs off to eat it in private. Not only are the biscuits delicious (according to Nocci), they are nutritious. The biscuits are grain free and high in protein. I give AJ only two brands of treats, and these are one of them! The ingredients say it all. The treats include a great amount of protein, and AJ can never get enough. AJ won't rollover for a treat unless its tasty (he's just a little picky), and these do the trick! Tasty and healthy, its a win-win! Pawfume Premium Grooming & Finishing Spray keeps your dog smelling clean (not like Fritos) without the bath. The hypoallergenic, alcohol-free sprays not only have a long lasting smell but also condition your dog's coat. Just spray a little on your hands and rub it through your pup's coat. If you brush your dog's hair, apply some to the brush to help the detangling process.